Aufruf: Rettet die Schenke / Save Schenke! die Schenke ist an einem Punkt, an dem die weitere Existenz dieses Raumes in Frage steht! Wir sind trotz vieler Spenden noch immer in einer finanziellen Notlage, da es keine langfristige Zukunftsperspektive gibt, wie wir die Miete auftreiben können. Wir haben uns eine Deadline gesetzt um zu beschließen, ob es weitergehen kann – bis Ende Oktober habt ihr also Zeit eure Ideen einzubringen! Darum geht dieser Aufruf an alle – noch ist die Schenke da – bitte nutzt diesen Raum! Bringt Leute her, erzählt allen von der gegenwärtigen Situation! Vielleicht gibt es Leute, die sich vorstellen können, regelmäßig einen monatlichen Betrag auf das Schenke-Konto zu überweisen? Auch der kleinste Beitrag ist eine große Hilfe. Eine kleine Rechnung: finden sich 80 Leute, die monatlich 10 Euro entbehren können, ist die Miete gesichert. Schenke is at a point where we question if the project can continue at all. We set us a deadline for the end of October to decide wheter. We still need money to pay for the rent every month and right we don’t see any long term way of collecting this money each month. So this is a call to everyone – now the room is still here and you are very welcome to use it! Also if you can support the place with money, a short calculation: if 80 people each give 10 euro each month, the place would be saved! Please spread the word about the situation! Die Schenke is closed in the last week of August and the first week of September. We are looking forward to welcoming you on Thursdays during the opening hours (4-8 pm) before and after that! In der letzten August- und der ersten Septemberwoche muss die Schenke leider geschlossen bleiben. Besucht uns doch davor und danach an Donnerstagen zwischen 16 und 20 Uhr! Dear unsers of Schenke, today Schenke is open only from 6 to 8 pm. Liebe Schenke-Nutzer*innen, die Schenke ist heute nur von 18 bis 20 Uhr geöffnet. Danas je Schenke otvoreno samo od 18 do 20 sata. Dear friends and users of Schenke, we urgently need money in order to be able to pay this month’s rent (about 750 Euros). As a self-organized space we rely on donations by people who think that independent, non commercial, anti-racist and feminist spaces are important. 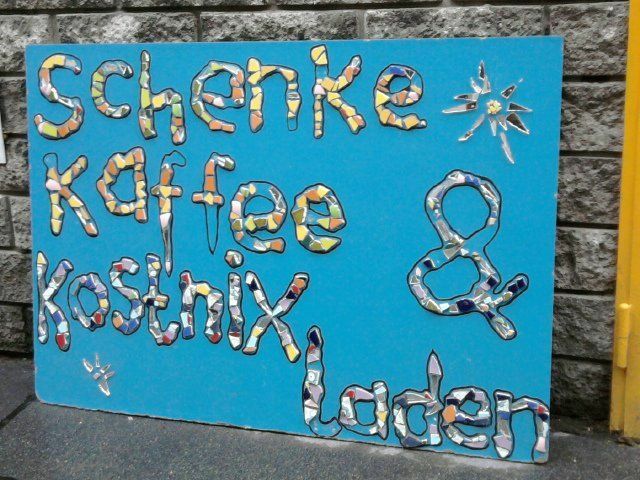 Please show your solidarity by supporting Schenke with a „sponsorship“ (a monthly money order of 1 Euro or more 🙂 or a one-time donation! Die Schenke ist ein kollektiv organisierter Raum mit emanzipatorischem Anspruch. Ressourcen sollen hier für so viele wie möglich zugänglich gemacht werden, frei vom ökonomischen Wert (Preis) – durch freies Geben und Nehmen, ohne Tausch oder Geld. Leider braucht auch solch ein Raum in einem kapitalistischen System dringend Geld, um Miete und Fixkosten zu begleichen. Bei dieser Party habt ihr die Gelegenheit, uns zu unterstützen – und dabei gemütlich Punsch, veganes Essen und (Live-)Musik zu genießen. Kommt vorbei, seid solidarisch, habt Spaß! Leider ist der Raum für Rollstuhlfahrer*innen derzeit nur nach Absprache zugänglich! English: Schenke is a collectively organized space with an emancipatory claim. Our goal is makeing ressources accessible for as many people as possible, based on free giving and taking, without barter or money involved. Unfortunately, under capitalism also a space like this needs money for rent and overhead. This party gives you the opportunity to support us, sharing punsch, vegan food and (live) music. Come along, show solidarity and have fun! Unfortunately, Schenke is accessible for wheelchairs only upon consultation. Bosanski/hrvatski/srpski: Šenke je otvoreni samoorganizovani kolektivni prostor koji teži da omogući pristupačnost različitim resursima što većem broju ljudi, pri tom se ne vodeći tržišnim vrednostima. Reč je o potpuno besplatnom uzimanju i davanju, koje ne uključuje razmjenu novca, ili direktnu razmjenu uopšte. No, obzirom da Šenke ipak egzistira u kapitalističkom sistemu, hitno su potrebni novci za rentu i druge troškove. I tu na scenu stupa solidarnost! Ako želiš da podržiš ovaj projekat – dođi na parti da se skupa zabavimo uz punč, vegan klopu i (živu) muziku! Za osobe koje koriste kolica prostor je nažalost trenutno pristupačan samo uz prethodnu najavu. bevor das Jahr 2015 zu Ende geht, möchten wir euch noch zu einem gemütlichen Abend in der Schenke einladen! Es wird Punsch (ohne und mit Alkohol) , sowie etwas zu Essen geben. Das ist zudem eine super Gelegenheit, mal wieder in die Schenke zu kommen, Sachen herzuschenken, die ihr nicht mehr braucht un nach Neuem Ausschau zu halten. Außerdem ist die schenke wieder ziemlich in Geldnot und freut sich über Spenden! Oder gar Pat_innenschaften, bei denen mensch jeden Monat einen kleinen Betrag (3€? 13€? 20€) überweist und so mithilft, die Miete zu zahlen und letztlich den Raum zu erhalten. Wie auch immer: wir freuen uns, wenn ihr Lust habt, am 16.12. vorbeizukommen! Ab 19:00 Uhr gehts los! PS: Öffnungszeiten sind grad eigentlich Dienstag (FLIT* only) und Donnerstag (alle willkommen!) von 16 bis 20 Uhr. Aber vom 22.12.-6.1. wird kein Ladendienst sein! Soon the Year 2015 is going to end, and we would like to use this opportunity to invite you to a cosy evening in Schenke! There will be punch (with and without alcohol), and snacks. This is also a great opportunity to give away things you don’t need, and find new things you might want. Also, Schenke is again in a very precarious situation and urgendly needs donations! At the moment we get donated about 300 Euro but the rent is 700 Euro. It would be amazing if as many people as possible could donate a small amout each month (3€, 13€, 20€), so that the hole of 400 € can be filled. Furthermore Schenke is currently empty on many days, and would be happy to be used more! So if you want to use the space for events, plenaries etc. feel free to contact us. At the moment the collective is quite small, and would be happy if more people would like to join us, for example for being there durring the opening times, organising events, contruction sites, and so on. Anyhow: we would be happy if you join us on the 16.12. at 7pm for a cosy punch evening! Meta Nights proudly presents a secret concert. All participants will receive a secret venue as a message one day before the show.Dreamy concert with Dream Wife (IS/UK)Dream Wife ooze with girl power; infecting the crowd with their trademark „poolside pop with a bite.“ The music juxtaposes simple pop hooks, beats, cutting riffs and dreamy vocals. As a collaboration with a gang of art school friends the world of Dream Wife is brought to life with vibrant live shows, pastel mania and flying pompoms.https://soundcloud.com/dream-wifeMORE ABOUT DREAMWIFE:It started out as a fantasy… literally. Icelandic singer Rakel and British musicians Alice and Bella played their first show as part of a performance p…roject at art school in Brighton. Stuck in dreams of 90’s club kid nostalgia they continue on making music, embracing their love for edgy pop. Dream Wife name David Lynch’s women as a big influence;“powerful and seriously fucked up“. They play with the aesthetics of the 1960’s ye-ye girls movement, along with current influences such as Sleigh Bells, Le Tigre and Grimes.Their live performance and release of their first single ‚Believe‘ earlier this summer Dream Wife starting gaining attention of music lovers; NME music magazine named them as ‚buzz band‘ of the week in their June issue and both I-D Magazine and DIY praising them for their unique raw approach to pop music calling it a: ‚Bloodthirsty take on glam pop‘. Alongside with playing shows in Europe this summer, they’ve been recording material for their first release with will be at the end of this year and also collaborating with exciting artists from both of their home countries, such as Icelandic electro duo Young Karin, female rap group ‚The Daughters of Reykjavik´ and praised visual artist from London, Maisie Cousins and Meg Lavender to name a few. Unfortunately Schenke can be open only once a week at the moment due to momentary lack of people/power to support Schenke. WE ARE URGENTLY LOOKING FOR PEOPLE WHO WANT TO PARTICIPATE IN SCHENKE COLLECTIVE AND HELP US TO KEEP IT OPEN MORE FREQUENTLY! If you are interested, please send a mail to schenke@geldlos.at if you want to join, or come by on a thursday. Leider kann Schenke momentan nur 1x die Woche geöffnet sein wegen momentanem Mangel an Kräften/Personen die die Schenke unterstützen. WIR SUCHEN DRINGEND LEUTE DIE MITMACHEN WOLLEN IM SCHENKE KOLLEKTIV UND HELFEN KÖNNEN DASS DIE SCHENKE WIEDER ÖFTER OFFEN SEIN KANN! bitte schicke uns eine Mail an schenke@geldlos.at falls du mitmachen magst, oder komm an einem donnerstag vorbei. četvrtkom 16:00–20:00 sati, utorkom je Schenke privremeno zatvoreno. Morgen Dienstag 31.5. hat die Schenke leider geschlossen. Tomorrow Tuesday 31th of May Schenke is closed. von 22.3. – 31. 3. hat die Schenke wegen Ostern geschlossen. Wir machen am Dienstag den 5.4. wieder auf. Bis dann! From 22.3. – 31.3. Schenke is closed because of Easter holidays. We will be open again on Tuesday 5.4. See you then!